Whilst the design may be a little mediocre, the rest of the Galaxy S5 is so much more; With a great camera and crisp display, the S5 is great all rounder that'll get you through the day. The Samsung Galaxy S5, Samsung’s latest generation of the Galaxy, was unveiled on 24 February 2014 at Mobile World Congress in Barcelona, Spain, it was released on April 11, 2014 in 150 countries, and being part of the Galaxy range, it is kind of a big deal. As somewhat of an iterative upgrade to the S4, which isn’t necessarily a bad thing, the S5 upgrades are pretty crucial, but not overwhelming. It’s very similar to all the other top phones released this year. The specs out it on a par with the HTC One M8, the Sony Xperia Z2, and even the LG G2. This left me wondering what the special selling point is here. The HTC range has it’s BoomSound and unibody appeal – arguably also the Ultrapixel cameras-, the durability and cameras of Sony and Nokia, and LG with their flexible displays and QHD screens, and Motorola with their were-not-a-nexus-but-we-want-to-be attitude. Samsung’s, to me, have always been plasticky, in a bad way. Sure, the cameras are good, but there really hasn’t been much pulling me there. They just seem a little gimmicky. So, is it? When first released, I wasn’t very sure what to make of the looks of the Galaxy S5. There was a lot of stick going around for how the Gold version looked like a plaster, but I don’t think it does. 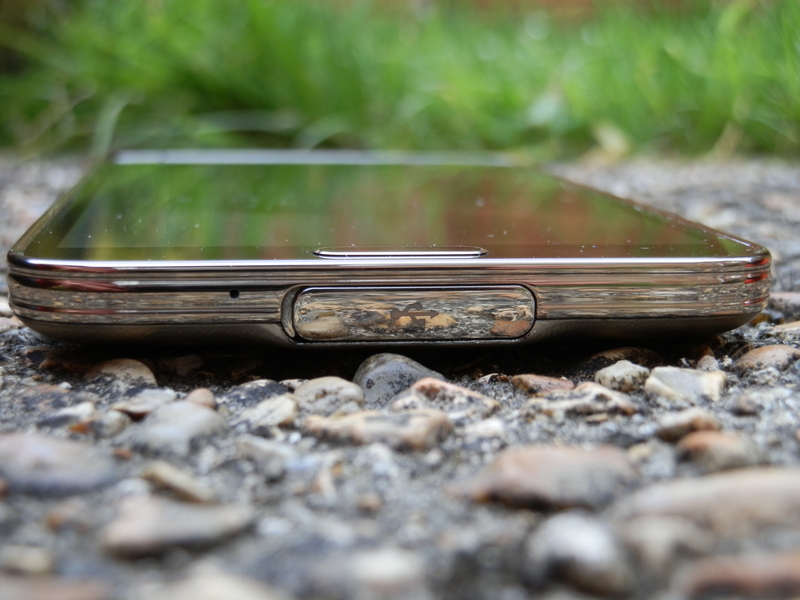 The back is, however, something that separates it nicely from the S4. Whilst it is still plastic, it feels a lot more premium – It is much more grippy, and and has a much nicer soft touch feel to it. Now, looking at the front; we have the display with a narrow ring around the edges with a chrome-effect band, which colour matches the back of the device. Samsung have chosen to again stick with having a physical button for the home key, which has the same chrome ring around the edge, with 2 capacitive buttons on either side – The left is for your recent apps, and the left functions as the back button. 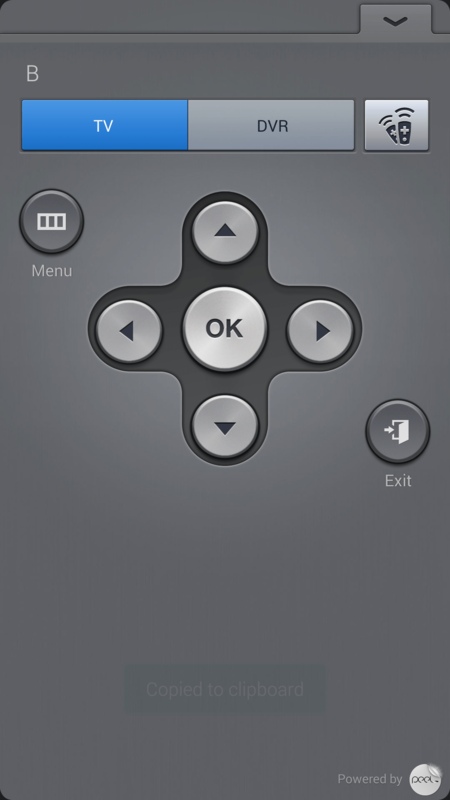 The power button remains around thumb height on the right, and the volume buttons sit a little higher up on the left. 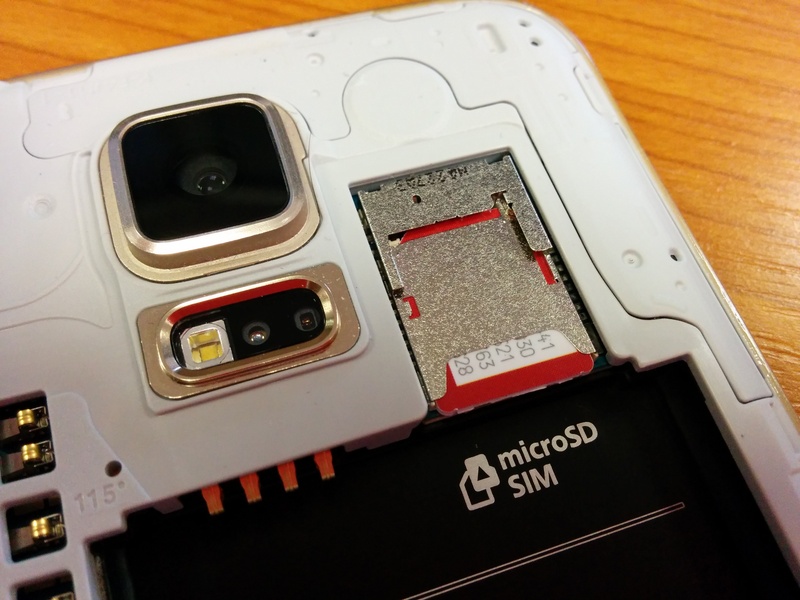 The SIM and microSD are stacked in the same space. I was a little concerned about the size, as I prefer to use devices around the 4.3″ size, but the S5, thanks to it’s small depth, fits nicely in my hand and doesn’t look too out of place when in my pockets. It doesn’t feel like it is going to snap in 2 if I sit on it, either, but I probably shouldn’t recommend doing that. Samsung have also gone some way to add a, now increasingly common, feature to the phones: It is protected against dust and water ingress and can be dunked for 30 minutes of your precious time, up to 1 metre down (IP67 rated). That is provided that you have the back on properly and the USB port cover is put on correctly. 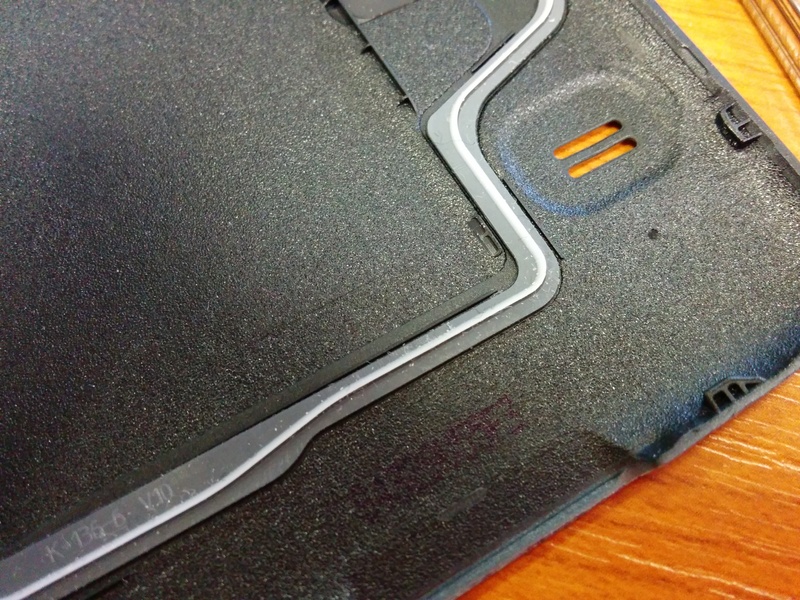 If the back is not on properly, the rubbery gasket seal may not be protecting your device, and it probably wouldn’t take long for your phone to succumb to the watery depths. Basically, if you drop it down the toilet, in the sink, or bath you’re safe – Well, kinda, they do state that impact may loosen the back and multi-purpose jack covers, meaning it may still get wet. But don’t try to use it to watch TV in the shower or bath – The quick start guide explicitly states not to put it into soapy water… or salt water and ionised water. 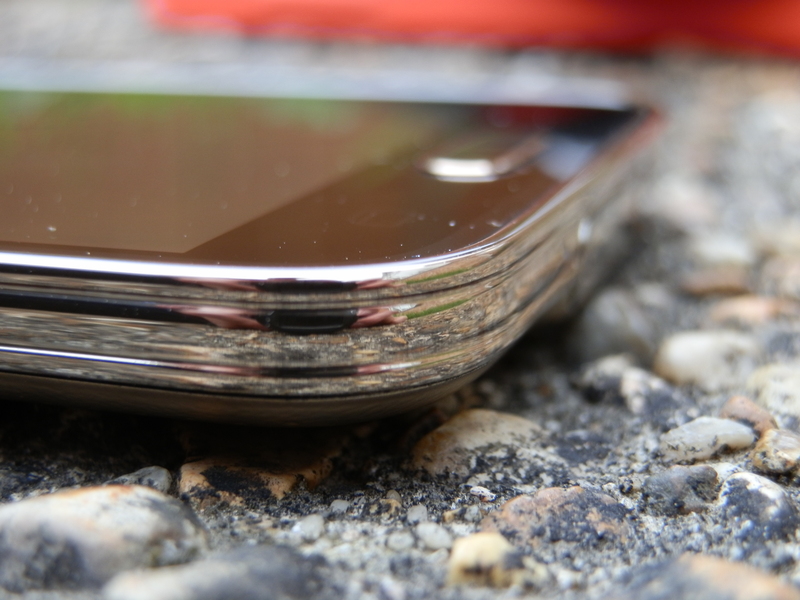 When ever you take the back off, you may want to wipe down the phone itself so there is less dust, and also make sure the rubber gasket is dust free, as otherwise it can affect the water resistance. The waterproofing disappoints me a little – there are too many clauses and possible escapes, so I wouldn’t ever fancy your chances of claiming if it does go wrong. To me, it seems like they are saying it is waterproof enough for you to prove it so to your buddies, and not a lot more? Unfortunately, I don’t know much about how Sony talk about this for their devices, so I can’t say which I would trust the most. Once again Samsung have gone for the Super AMOLED screen tech for the S5. Whilst they have upped the screen by a whole 0.1″ to 5.1″, the screen resolution has stayed the same. Essentially, this makes no difference as you’re comparing the now 432ppi to the old 442ppi – I really don’t think I could tell the difference. The brightness seems up from previous versions, which also seems to be the case based on the GSMArena comparison of the S4 vs S5.. But whilst that is nice in doors, it is a little harder to read outdoors in bright sunlight when compared to the IPS screens on the One M8, and the iPhone 5s. If you do a lot of gaming, or watching of videos, and viewing of pictures, then you’re going to enjoy the black levels and slightly over-saturated colours that come along with this. Samsung have also bundled a few display modes in that adjust the colours of the screen slightly. As default it is set to “Adapt Display”, which will optimise the colour range, saturation, and sharpness of the display for a set of applications, such as the Camera and YouTube. Otherwise you can set it to be Dynamic, Standard, Professional Photo, and Cinema, Cinema works nicely if you’re watching something in Google Play Movies and you don’t think that Adapt display has quite optimised it. It does make those videos of cats on YouTube look pretty awesome, though. Whilst this is not strictly to do with the physical display, it does come under the Display section: Why they allow you to change your font and only include a few others, most of which are garish, I do not know. It kind of cheapens the experience a little. As you’d expect though, the viewing angles are decent, and for 98% of the time the display is one of the best you can get on the current phones (pre QHD resolutions, which could change things). Whilst not having the quirky cameras found on the HTC One M8, the Galaxy S5’s camera have a mass of improvements to passed generations. The megapixels have been upped to 16, and they’ve even added a DSLResque phase-detecting autofocus. If you like to shoot video on your phone, you can now do so in full 4k resolution. The sensor is 1/2.6inch, which is larger than that on the second coming of the HTC One, which comes in at 1/3inch. 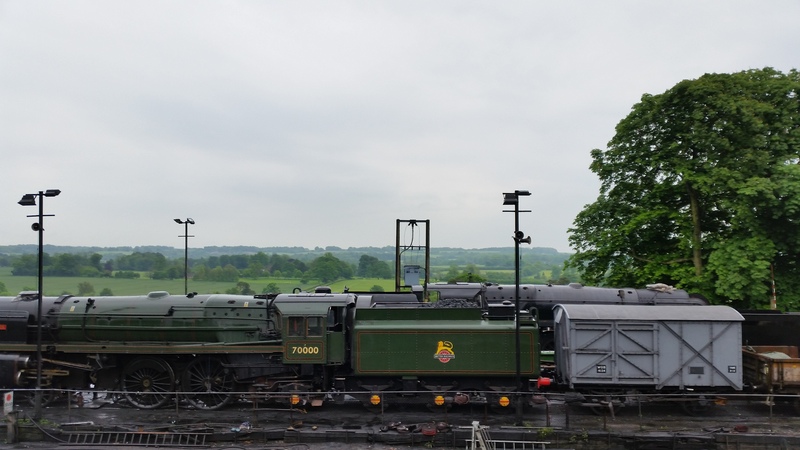 To me, that doesn’t mean that much, but it does however result in some pretty amazing photos, mainly in daylight. The auto focus is super quick and can focus in around 0.3 seconds. I say can, often times I found it taking up to a second or more for it to pick up what is in the scene before focusing can actually happen. Whilst that is not terrible if you’ve used a Nexus 5, it does mean that you can miss some of those shots of fast moving objects, such as children and pets. When recording a video, the auto focus does seem to happen really quite quick. The HDR setting makes quite a massive difference when balancing out images with lots of shade and light going on. This isn’t just for pictures either, it seems to do it in videos, too! 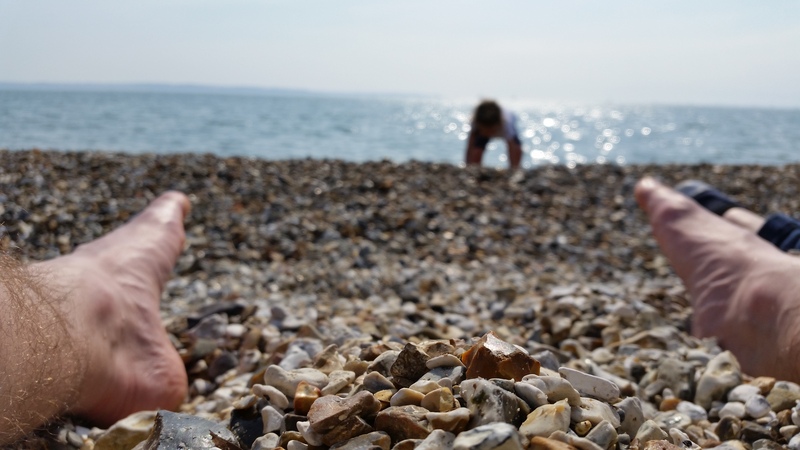 There are a number of modes on the camera for you to use; some of these are more useful than others, such as the panorama mode. I still haven’t found a practical use for the virtual tour that it offers; I think part of this is down to me trying to use it as a photosphere when it clearly isn’t. Burst mode can also be enhanced by using the “shot and more” mode as this allows you to do such things as erase objects from images if they have cut in, take a sequential shot highlighting the moving object, or pick the best shot. In low light, however, I was a little deflated. The noise levels were really quite bad, and it struggled to focus on objects. Whilst the flash works quite well, LED is never going to be as good as Xenon, and flash is never going to be as good as daylight, but still. I found myself grabbing my One Mini in the evenings to take pictures of my kittens. The front facing camera was fine for the wonders of “selfies” in decent lighting, but I found it to struggle a bit in the low light as well. You’ll have to take my word on that though, as I don’t plan on subjecting you all to man-childish looks – Sorry. Old Steamer set to focus just above the train. 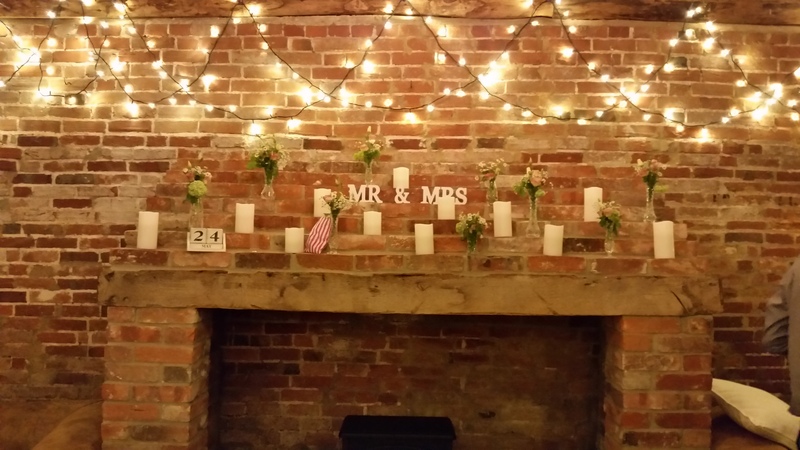 Low light shot of some candles – it came out better than I had expected. 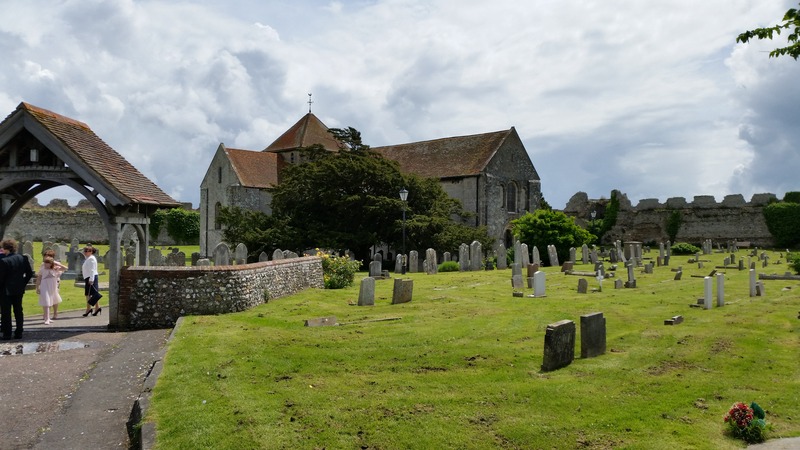 Local church in decent sunshine. Near focus works incredibly well. These stones are about an inch from the lens. 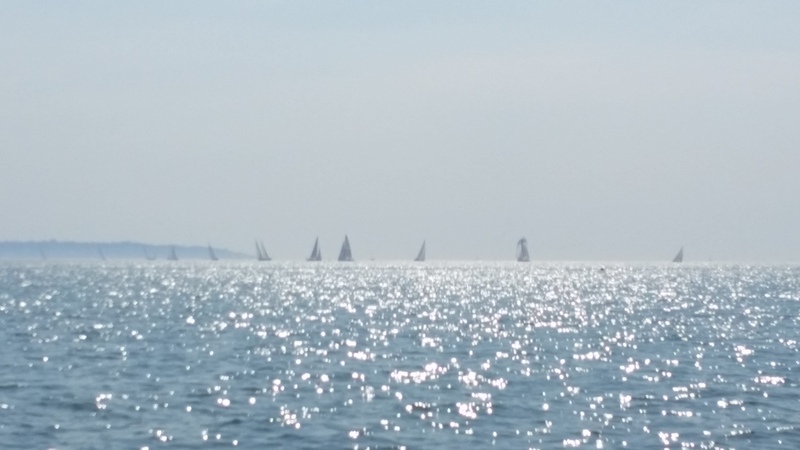 Focusing on the yachts in the solent. 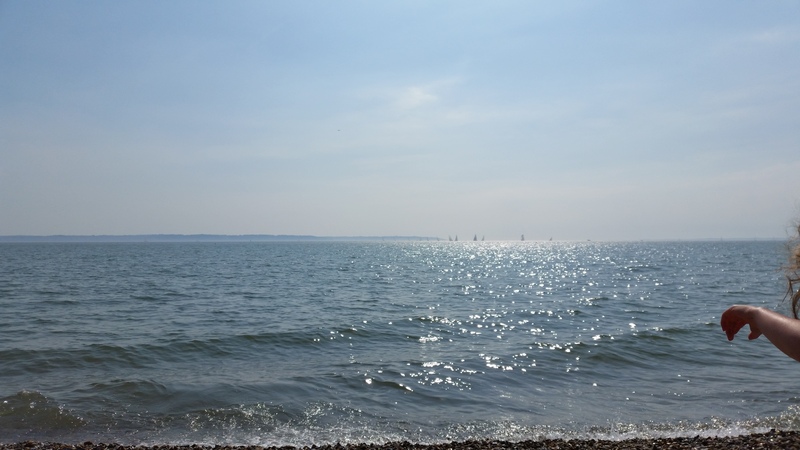 Beach shot with less harsh reflections. The S5 is currently running on Android 4.4.2, KitKat, with Samsung TouchWiz running on the top. Along side of thism, they have added in a fair few software features, as you’d have come to expect. Starting with the home screen, if you swipe to the left you are greeted by Samsung version of HTCs Blinkfeed, My Magazine. My Magazine is a very photographic news feed. You can pick from a number of categories such as Music and books, and bring in your pick of a selection of Social Media sites such as Twitter, 500px, and Google+. I must admit though, I did find myself skipping over My Magazine, and it is something I ultimately turned off. I did the same for Blinkfeed though, I just don’t like to consume my information in this way. One thing that is likely going to be a necessity is changing the settings page back to list view. The grid layout, to me, made everything unclear and harder to use. Whilst there is also a tab mode, they are not swipeable so I soon gave up. You can change it by going into the overflow menu at the top right of the settings screen. Samsung seem to be very much on to the health band wagon right now, having just released a couple of smart watches of which one is directly aimed at fitness (Gear Fit). However, I didn’t have one of these with me for this review, so I am likely missing some of the benefits, such as more accurate step counts – due to not always having the phone in my pocket or walking around with it. The key part of S Health for me was the heart rate monitor. Not for any health reasons, although it seems reliable enough when compared to old fashioned manual counting, but because it was fun to see how much difference there was after going for a run, or even a quick walk. For me it is largely pointless and there just to show off, but I had fun with it. I can see the use of this if you do have health concerns or whatever would make you constantly want to check your heart rate. The sensor itself is next to the LED flash on the back. 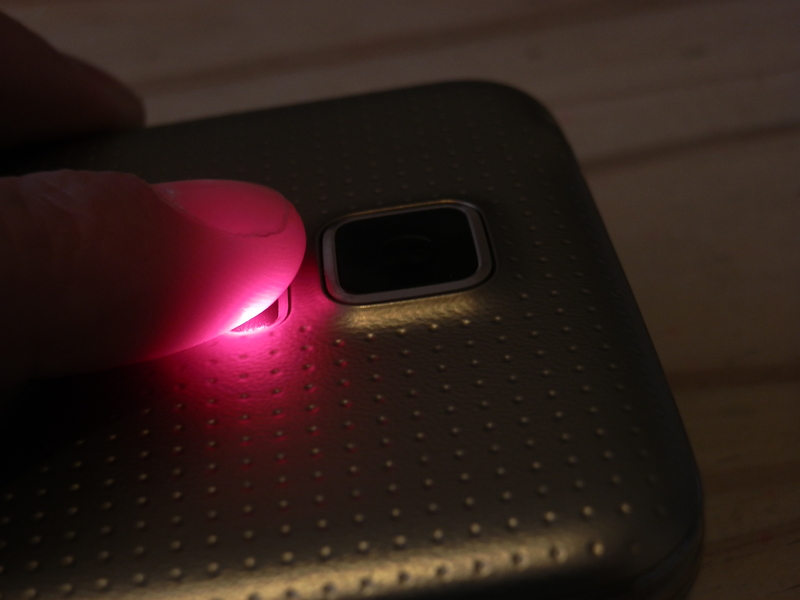 When it picks up you finger, it illuminates the aforementioned appendage in a comforting red glow. Don’t press to hard, or move too much, otherwise you reading will either be wrong or it will just flat out fail. It is very consistent when in use and wasn’t as much of a pain as I thought it may be to get it to work. I was a little let down here. 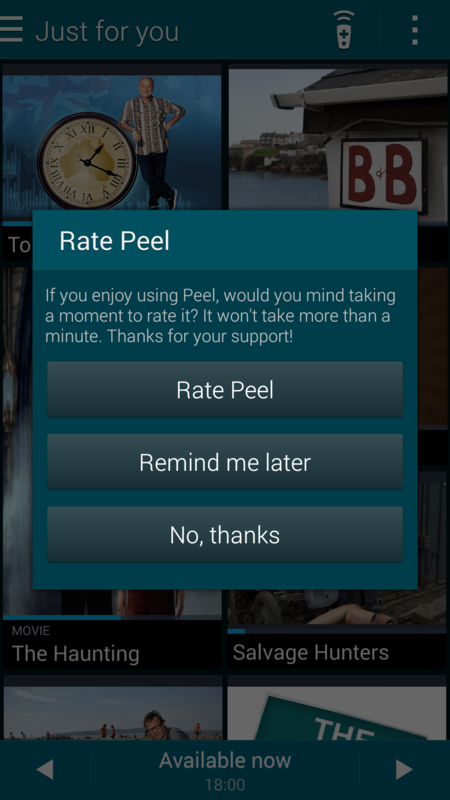 Sure, it looks much nicer than Samsungs older implementations, but Peel, which it is based on, is still lacking. Compared to the HTC setup on the M7, and LG’s on the G Pad, I found it to be cumbersome, and a little poorly designed. The most annoying thing for me was it always displaying. On my G Pad, I can ste it to only show on the lock screen when I am connected to my home WiFi. 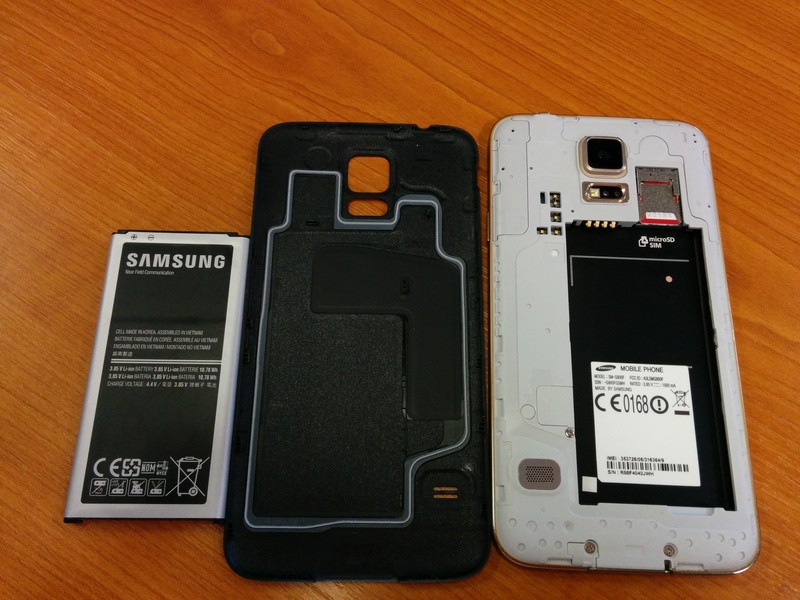 On the S4? Not so much. 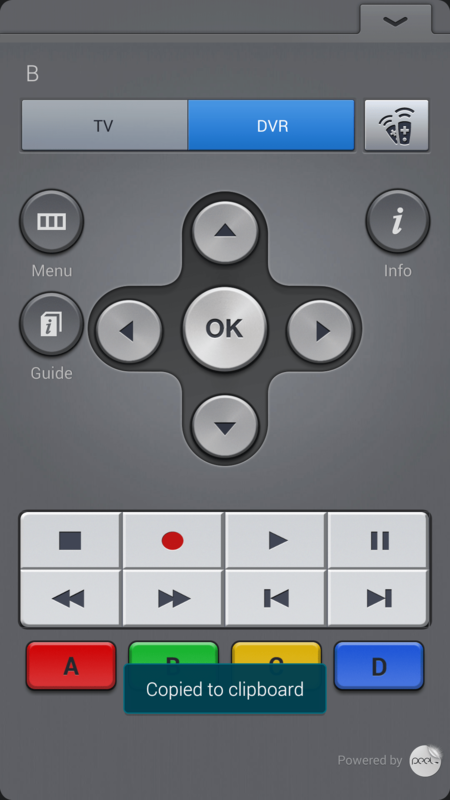 When setup, it is always turned on and cluttering the lock screen, unless you completely disable it, which means it isn’t as readily available and you may as well actually go to the TV remote. Technically, it works fine. I was able to pair it up to a couple of LG, Samsung, and Sony TV’s, and other home entertainment equipment. .. and a mass of wasted space. … because it does not exist. One handed mode was actually one of my favourite add ons. It is so much more than just a one handed mode, and I found myself defaulting to it most the time, and using it a lot for the links you can have on the side. 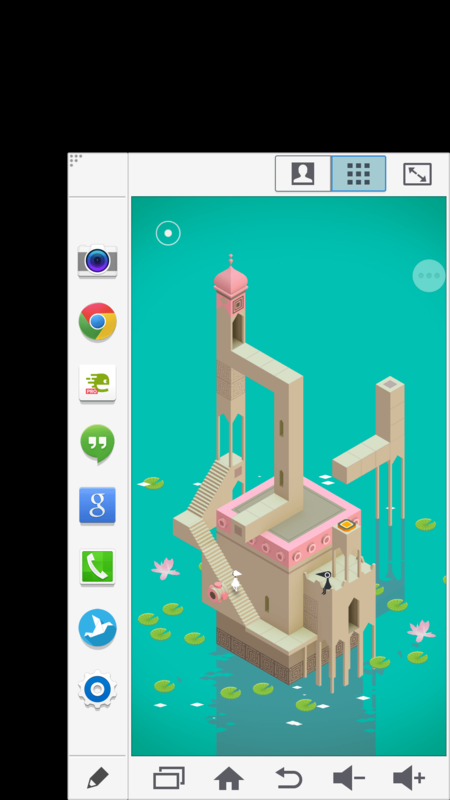 Gone was the need to press home or go to recent apps to switch between a game and hangouts. The shortcuts soon replaced me using the system dock. Even more so where you can get to this screen just by swiping from the right half way, and then back. If one handed mode isn’t your sort of thing, toolbox may also be worth looking at. 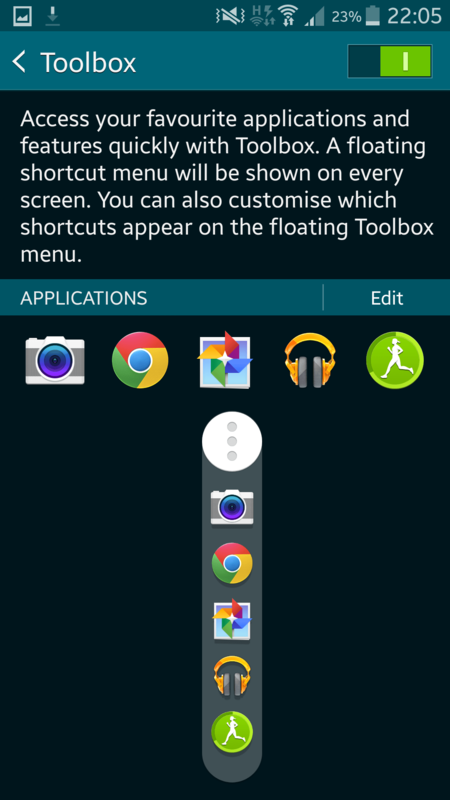 Toolbox adds a floating circle which you can move around anywhere on your screen. Pressing it will expand the list of your 5 configured apps, allowing for quick switching from anywhere. It did get rather annoying having it always on the screen and blocking some interactions, but it is still quite useful. This one is quite self explanatory. You can have 2 windows open at once. This one was particularly useful when opening links from emails. Other than opening links from emails, you can use a number of Samsung apps, as well as a couple of others, in this mode. I’m not sure if it was me or a limitation, but I couldn’t find a way to use every app that I would’ve liked to. Other than apps, it can also list your favourite contacts. Much to my writing this off as a gimmick. I am going to miss it. Those of you who have used the S4 will already be familiar with this feature, however, Air View allows you to get a preview of some data, in Samsung apps, by floating your finger above the screen, and not actually having to touch it. Sure, it is not in all apps, but it is in the phone dialler, S Planner (Calendar for you normals), the gallery, the video player, and emails. Hovering in these apps will provide you with an overview of what is inside, without having to click in, and go back once you’ve read it. In short, it’s like a tooltip on certain operating systems. For example, emails will give you a few lines of the content of the email, the calendar will give you an overview of the day, and the dialler will show you who is assigned to that speed dial. 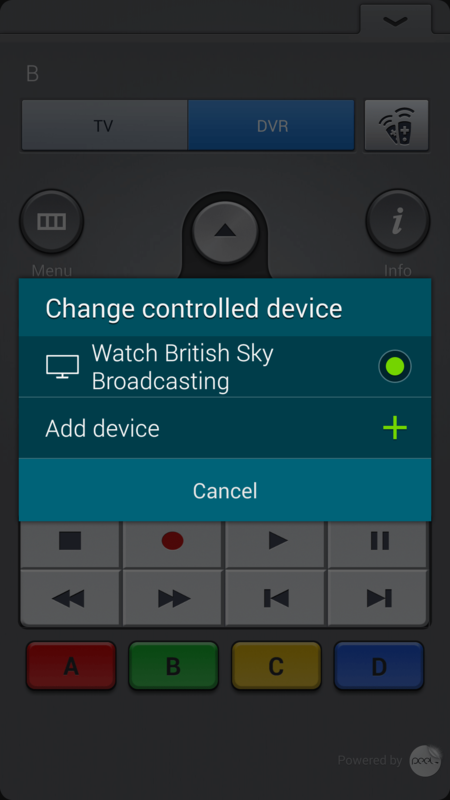 It’s really something I didn’t think I’d use, but if you have an S4 or S5 already, go and turn it on. If you don’t, and you get one, turn it on. Even if you don’t like it, I think it is worth a try. Both of these modes are very similar, with a few minor differences. Both restrict the interface so you can only access a few set options. Ultra power saving mode, much the same as the Extreme power saving mode on the One (M8), greys out your screen, disables data, and restricts which apps you can use. Whilst it is restricted, you can pick from a much bigger list than you seemingly can on the M8. Based on the estimates this can turn 15% of battery into a day or more. Emergency mode is much the same, but with colour, and options to send your location. Initially, this looked like a great idea – being able to send where you are and ask for help discreetly could save your life, but like this, I am not so sure. It took far too many presses to send the messages out; something that may not be as subtle as it could. Again, it should extend your battery life rather significantly, but not as much as Ulta power saving mode. This proved to be a bit of a love hate relationship to start off with. Despite programming my thumb in 3 different ways (the maximum that you can), I was finding it impossible to get it to know it was me. Occasionally it would work, but others it wouldn’t. It didn’t seem to matter which way I held it, it just didn’t like me… To start with. As the 2 weeks went by, I was finding I was getting much better success with it unlocking, and I think I may have been holding it wrong. You can also use the sensor to authorise PayPal payments – I didn’t try this as I don’t like the idea of it, but it is worth mentioning. Having little experience with other Android phones that use a finger print sensor, I can only compare this to the iPhone 5S; In short, the 5S is a lot more reliable. Easy mode: This makes everything big and easier to use. It seems more like a feature phone with it on, and could be useful for the elderly or those wanting a simpler experience. I do question why they would be using such a phone, other than for screen size. However, it seemed a little buggy as it decided to keep the font size on large when I turned it off. It would have been nice if it remembered that I was set to small when I turned it on. Download Booster: I never got this one to work, and I don’t know why. In theory, when turned on it should use both your WiFi and mobile data to speed downloads of 30MB or more. The sound quality in the S5, overall, is decent enough. Audio over aux and bluetooth was nice and crisp and you’d expect. The speaker on the rear, however was a little bit of a disappointment, to me anyway. It’s probably not fair for me to compare the single speaker on the S5 to HTC’s BoomSound, but it really is lacking. I’d have thought the days were coming where stereo speakers, even if rear facing like, where coming a common feature. Samsung obviously do not think the same. The audio that does come out is bare able, but not a lot more. If you listen to music with much bass, and want it so you can hear it, expect to get a whole lot of vibration on the back of the phone – admittedly something that is mentioned in the user guide. I’d possibly even rate the Nexus 5 audio higher than the S5. They do have a couple of sound settings, for the equaliser, however I didn’t tell all that much difference between the 2. For non music use, the ringer and notification tones, came out nice and clear, but again I wish it could have been a little louder, as a did miss it a little when in my bag. Whilst not actually to do with sound as such, Samsung have a feature to adjust the strength of the vibration, something I seriously wish other device manufacturers would add. The ear piece speaker is nice and crisp, and with HD voice (on supported networks) it sounds almost too real. Being such a popular device, you can expect a whole myriad of custom ROM development to be going on. This is something that XDA has a plethora of different ROMs to choose from, with a fair selection of tweaked stocked ROMs as well as AOSP based. At the time of writing, there are already Android 4.4.3, released 12 or so days ago, options available. There are plenty of guides for rooting and unlocking your device to your hearts content, which are easy to find. Based on the fact that the S5 is sitting on top of a Snapdragon 801, you’d expect it to be one of the faster devices around, and with the occasional slow down Samsung’s TouchWiz, it is. For those in other markets, you can get an Octa-Core Exynos processor, but I can’t comment on that one. At times when running through the settings or launching the app switcher, it did feel a little big slow to launch compared to the Nexus 5, and sometimes it was a little slow to wake when wanted to do so. Otherwise, it seemed to fly through everything I asked of it; Games loaded fast, internet browsing was one of the quicker I have used on a phone, with sun spider scoring it higher than the Nexus 5, as you may have hoped. 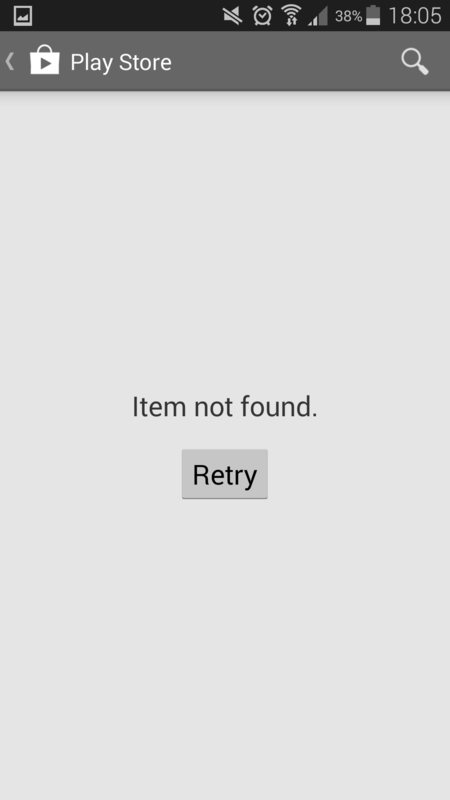 Page loading and other animations are smoother than I was expecting based on older Samsung hardware. The 2GB RAM on it, whilst fairly standard, put up fine and I had no issues with slow downs associated with running low. Battery performance was also pretty decent for me. I usually kill my N5 by mid day, but I found the S5 was able to go much longer than this; So much so that I was able to leave it until the next morning without having a phone that seemed to have shuffled off of this mortal coil. It’s the first time in a while that I have felt confident in taking a phone out all day and night knowing that I’ll be needing it to take a lot of pictures and video, and generally messing around with. 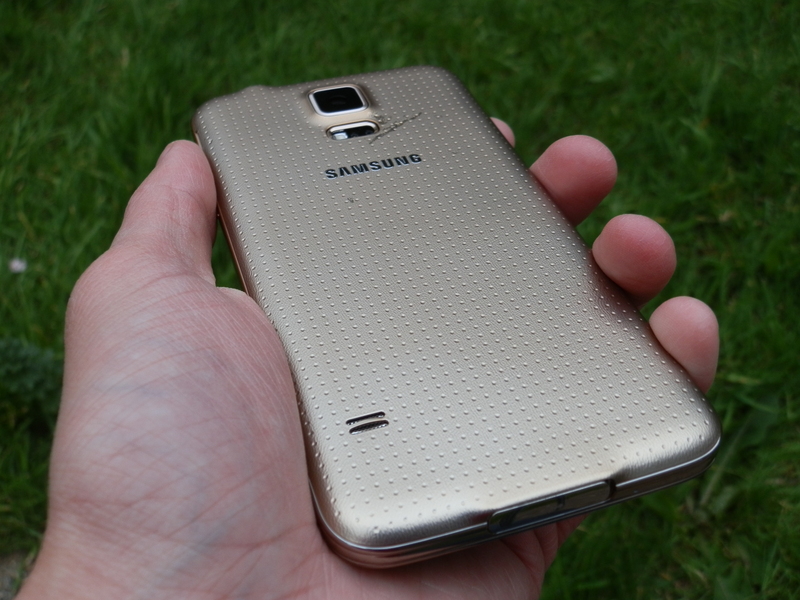 Overall, the Galaxy S5 is one of the best phones out their today. I mentioned gimmicks at the start, and it is something I was genuinely worried about. Samsung just throw so much time and effort into coming up with apps that seem to pre-date their need (air view), but I have to say, I think I am converted. Phones have reached a point that the tech is not really a barrier. Everything has kind of hit a peak for now, at least in my opinion. Sure, we are getting all of these super quick processors and more RAM than I expect to see in some computers, but it’s getting less thrilling to mention. Gone our the days of rapid changes going from a 256Mhz CPU to a 1Ghz CPU. Software is now the differentiator and I think Samsung are onto something. Yes, some of them are not going to be used, but you can turn them off, but bundling up apps like Stealth has, with it’s pedometer, heart rate sensor, and tracking, is really quite topical now. Wearables are getting more common, and Samsung have released their fair share of these – This is something I wish I had a chance to test as the Gear Fit looks like a viable option for a Sports Tracker for me, whilst still looking relatively normal. I also was concerned about it being plastiky. Well, after the first 5 minutes of scrutiny, I really didn’t care or notice. It feels nice, and whilst not the most inspired design, I found the gold did get a fair bit of attention.